Commemorate your loved one with elegant granite headstones, memorials, and engraving services from our experienced professionals in Mannington, West Virginia. Since 1820, Stewart Granite Works, the oldest manufacturers of granite memorials in the United States, has been handcrafting monuments and memorials with meticulous care. For your existing memorials, we offer expert engraving services. We understand how important the memorial we create is to you and your family, and that's why we complete every step of the process ourselves. Our current staff has 50 years of combined experience to ensure your memorial is created with unparalleled craftsmanship. Contact us today to have each of your memorial needs handled with class, care, and experience. 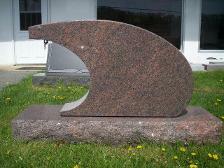 Call us for a quote on granite memorials that meet your needs.